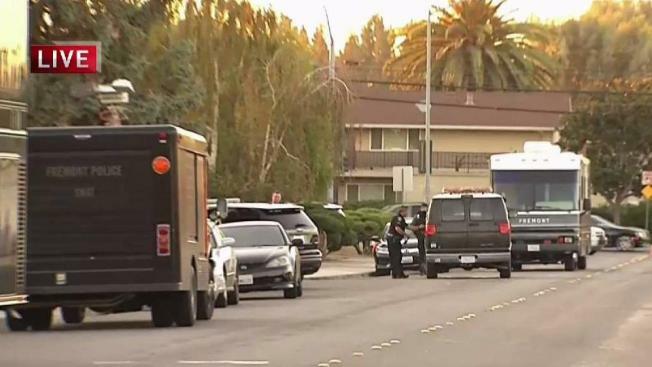 Police on Saturday cordoned off a part of a Fremont neighborhood when an armed man — with a violent criminal past and active warrants — barricaded himself inside a house. But when a SWAT team entered the home, he was not found, police said. The suspect, identified as Thomas Beltran, 41, is wanted for domestic battery, felon in possession of ammunition and a drug warrant, police said. The standoff on Darrow Court in the Glenmoor neighborhood began around 9:20 a.m. as a case of domestic violence, according to police. Officers responded to a 911 call and met the man's girlfriend. She said Beltran had battered her and was still holed up in the house, said police, who set up a perimeter. A SWAT team, tactical medics and dispatchers and hostage negotiators were called to the scene to negotiate with the man. About 5 p.m., the SWAT team entered the residence, and they deployed a robot, drone and K-9 unit but did not locate Beltran. At about 5:45 p.m., police gave the all clear for the neighborhood, and began taking down the perimeter without making an arrest. Beltran weighs about 210 pounds, is about 5 feet, 10 inches tall and is wearing an Oakland Raiders jersey, according to police. Two houses next to the residence in question were evacuated during the incident and a few others are under a shelter-in-place order. Darrow Court was blocked to traffic as was Logan Drive between Faulkner Drive and Central Avenue, police said. People with information are asked to call the police department at 510-790-6800.